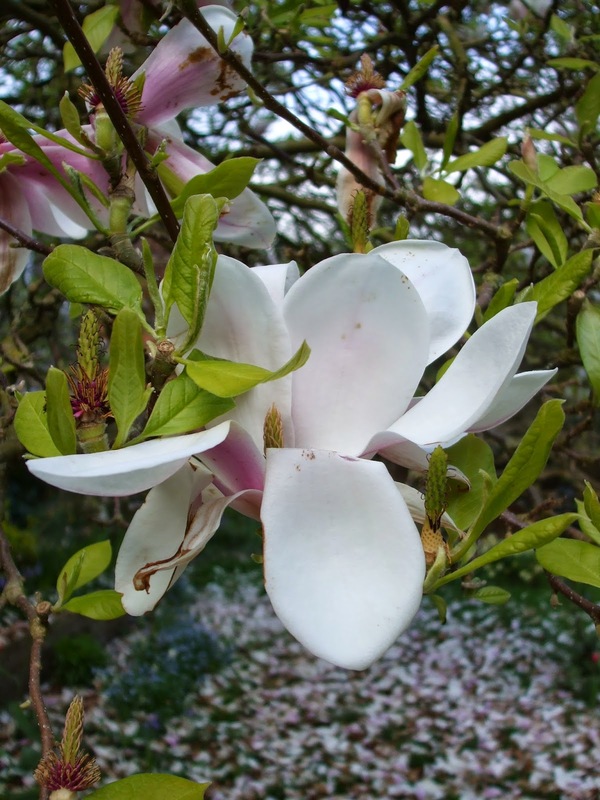 As I said in my post about magnolia with shades, the magnolia season is, sadly, all too brief. The gradual unfurling of the buds and their transformation into embryonic blossoms can take a few weeks, but once the blossoms have opened up their beauty is all too fleeting. The first petals began to fall over a week ago, and now there's a carpet beneath our trees, which, from a distance, still appear to be in full flower. Come closer, though, and you begin to see the gaps, the brown edges to petals still clinging grimly to flower heads, the ones flapping loosely in the wind. The tree, until recently so breathtakingly beautiful, now begins to look forlorn. We have daffodils and evening primrose that flowered but were beaten down by a return frost but the daffodils seemed more resilient as the day warmed and went from droop to half droop. The evening primrose turned very orange from yellow and are still facing the ground. I hope they make it. The Forsythia are yellow here on the NY harbor and were unaffected by the frost because they are different in configuration. I hope your flowers are still surviving and looking their best for Easter! We've had some very cold nights, but the daytime sunshine and warmth seem to be more than making up for that. Our daffodils are definitely on the way out now, but the tulips are still going strong and the wisteria has started to put out its first flowers, while the trees are covered in blossom. It's as if one plant or tree passes the spring baton to the next!